Happy Tuesday! Today's tag is made for Tuesday Throwdown's challenge using JoyClair stamps and the theme is tags/bookmarks. 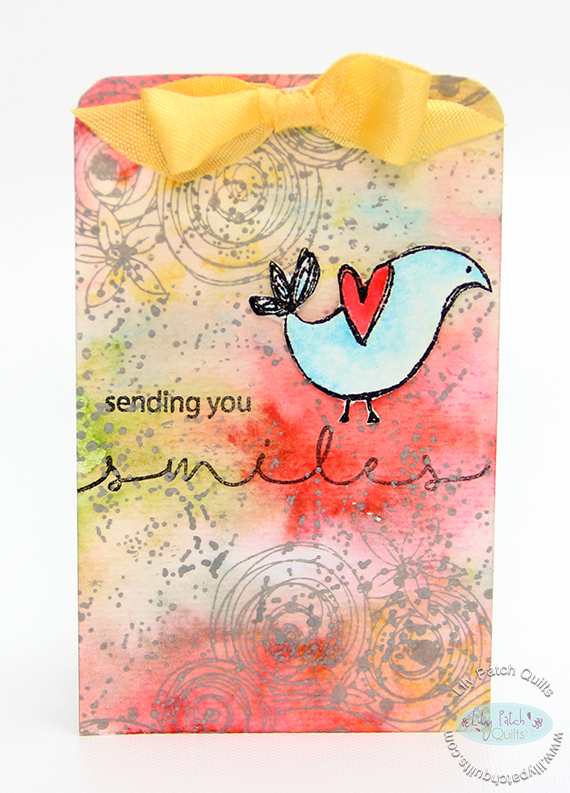 I am using Uh-Oh Ink Splatter, Hugs and Smiles, and a mini little bird stamp set. I started the tag by using the splatter images and coloring each one with Tombow Dual BrushMarkers then spritz water to disburse the colors. I then used a heat gun to dry the background. I stamped and watercolored the bird using Tombow markers also. To create the distressed stamping, I used a grey pigment ink and the floral image from the Hugs and Smiles set. I also used the dotted stamp from the Ink Splatter set with grey ink to stamp allover the tag. I then stamped the sentiment and used foam tape to adhere the bird onto the tag. I was going to leave the tag squared but changed it up and rounded the top corners. I have the video here to go along with this tag. Joy Clair has provided a fun prize for this week's challenge. Please head on over to the TT blog for more DT inspirations and enter to win a prize from our sponsor.